Many a time, we have heard about a vehicle called UTV. But then what is this UTV and what for it has been designed? UTV, the abbreviation for Utility Task Vehicle or Utility Terrain Vehicle is quite similar to that of ATV but are much larger and heavier. In case of UTVs steering wheel with pedals are used for brake and gas instead of handlebars. And many of the models have seatbelts and rollover protection, and some even can carry passengers and offer extended payloads. These 4x4 vehicles have been explicitly designed for off-highway use and not meant for paved surfaces! So are you looking for an ultimate adventurous UTV? Then we at TX Power Sports have brought to an UTV or side-by-side, i.e. TrailMaster Challenger 300-X 300cc UTV. TrailMaster Challenger 300 comes with powerful 4-stroke, single cylinder, water-cooled fully automatic CVT along with reverse engineering. There are various other features of this vehicle that include aluminum wheels, 4-wheel independent suspension, windshield, front steel bumper, side rearview mirrors, exciting graphics, large tires with 22x7-10 in the front and 22x10-10 in the back, speedometer and odometer, bikini sunshade top, side nets, turn signals, trailer hitch, adjustable steering wheel, large driving cabin fits person up to 6, electric start with kill switch, four-point safety seatbelt, individual sporting seats, adjustable driver seat: pedal to seat back adjustable from 38 to 43, adjustable heavy duty front and rear shock absorber, rack and pinion steering wheel, front and rear hydraulic disc brake, parking brake, sizeable rear utility rack and optional winch. 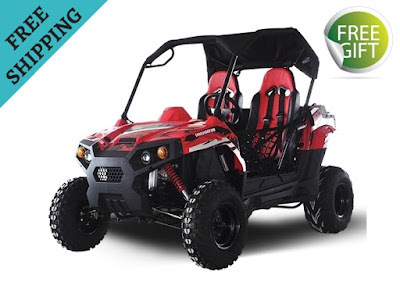 This UTV is ideal for the age group of 16 and above, and its maximum speed can reach up to 45 mph. So if you want to climb the hills, cross streams or conquer the dunes, you can do it all with TrailMaster Challenger 300 UTV. 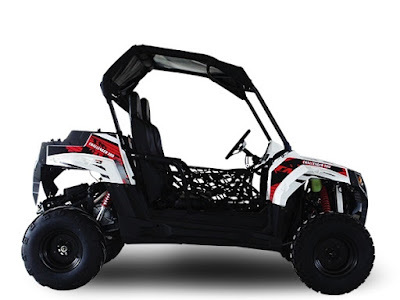 This UTV is designed and engineered to corner, cross, accelerate, climb and take you to the places that you want to go to satisfy your hunt for adventure. This high-quality UTV is suitable for any rough terrain. And we at TX Power Sports work our best to provide you such power sports at lower prices so that you get your desired vehicle at the best price possible. To buy this amazing TrailMaster Challenger-X 300cc UTV or any other power sports of your choice get in touch with us today. Call us at 1-877-214-4563 or email us at Sales@Txpowersports.com.